On 15th March Scottish butchers were battling it out to win a brand new award for Scotland’s top premium sausage. 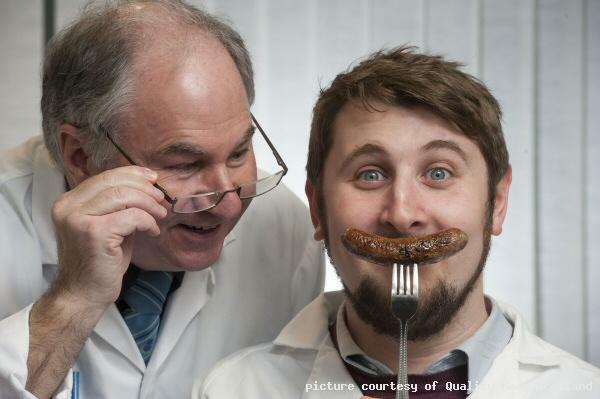 Lucky judges at the “Craft Butchers Premium Sausage Awards”, supported by Quality Meat Scotland, sampled more than 100 of the country’s finest sausages. Premium sausages are defined as sausages with a meat content of more than 72%. Premium beef sausages are required to be made from a minimum of 85% visual lean meat and pork sausages, 80% lean meat. Butchers from around the country entered their top sausages which were judged for their performance under a range of criteria including: taste and flavour; palatability; appearance; texture; and general appeal. The vast range of innovative sausages tempting the judges and showcasing the creativity of Scottish butchers included ingredient combinations such as pork and Dundee marmalade, pork, sweet chilli and lime and pork and toffee apple. The line-up of beef sausages included beef, cheese and jalapeno, beef with Dijon mustard and beef, tomato and mozzarella. The winners will remain under wraps until they are announced at the Scottish Meat Trade Fair in Perth on Sunday 12th May by which time results of analysis will be able to confirm that the winners have the required meat content. Jack Broussine, Marketing Executive with Quality Meat Scotland, explained the background to the new awards. “Many butchers have responded to requests from their customers for higher meat content sausages and we feel they deserve recognition for their innovation and product development,” said Mr Broussine. A recent survey of butchers by QMS revealed 92% of butchers’ shops experienced increased footfall in February (23 Jan – 23 Feb) following the media coverage of the horsemeat issue. Additionally, 95% said customers have been taking a greater interest in the source of meat. Douglas Scott, Chief Executive of the Scottish Meat Traders Association, welcomed the fact that more and more consumers are discovering the creativity and innovation to be found inside their local butchers’ shop. 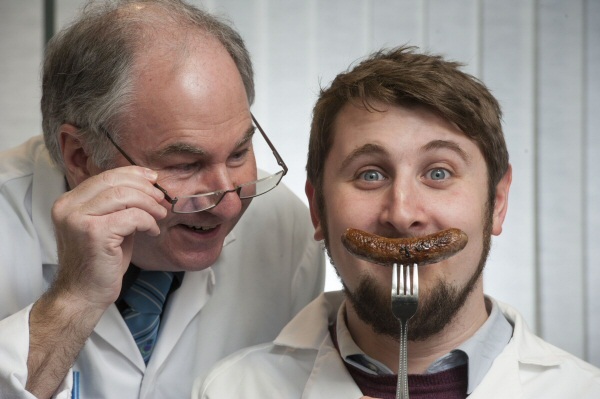 Meat Scotland, sampled more than 100 of the country’s finest sausages. pork sausages, 80% lean meat. palatability; appearance; texture; and general appeal. mustard and beef, tomato and mozzarella. background to the new awards. media coverage of the horsemeat issue. to be found inside their local butchers’ shop.